The Eaton Chelsea Hotel Review. Through the eyes of a kid. Gabby to be exact, she loves to travel just like her Mom and Dad and she always has her opinions about wherever we may go. That means, she sure does love to stay at hotels and everything is much different through the eyes of a kid. More wonder, excitement and discovery! You can see my review of the Eaton Chelsea in Toronto, here. Centrally located within walking distance to the city’s subway as well as the thriving business and shopping districts, Eaton Chelsea, Toronto offers travelers efficient and comfortable accommodation in the heart of the city. As Canada’s largest hotel, Eaton Chelsea, Toronto offers 1,590 contemporary guest rooms and suites for business travelers and tourists. From the comfortable Chelsea Room to the apartment-style One-Bedroom Suite, Eaton Chelsea, Toronto delivers warm and reliable service and a variety of accommodation. Club Room guests also enjoy access to the exclusive E-Club Lounge on the 25th floor. A premium private retreat, the E-Club Lounge serves a complimentary continental breakfast, all-day refreshments and evening canapés. I loved the room since it was so high up. The balcony was fun and I’m glad that my Mom let me go out and check out view. It was fun to see all the people walking up and down the streets. The bed was super comfy and I slept so well. The best part was the family pool! I loved swimming and then chillin’ in the whirlpool and THEN jumping back into the pool! The slide was AWESOME! It goes outside!!! If you’re a kid, you gotta come here! I liked the pool and the toy room, the kitchen in there too. I liked playing on the kitchen and the bunnies were cute. I liked making art with the glue and sparkles. It was so fun! From the mouth of babes. Needless to say, it was sure a hit with them. 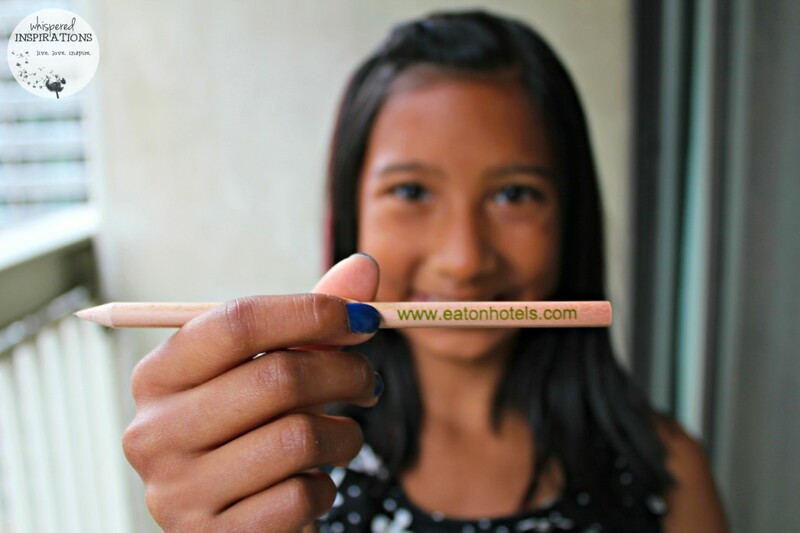 They got to experience the city and were catered to very kindly at the Eaton Chelsea. If you’re going to be in Toronto, you can book your stay at the Eaton Chelsea Toronto, here. You can also follow @EatonChelseaTO, they are pretty awesome on Twitter and always up for a good convo. You can also connect with them on FB, here. Do your kids love to travel? Previous Post: « Garnier Fructis Damage Eraser: Are You a Damage Criminal? Rejuvenate Your Hair with Garnier’s New Hair Care Line! Great reviews! It's definitely centrally located in downtown Toronto. It hadn't been on my radar prior to reading your reviews as it's a bit of an unassuming building! It is a great location, best feature I think. I love your review,I have never been to Toronto but hope to go sometime.